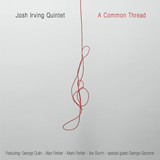 The new album recorded April, 2006, featuring George Dulin (p), Alan Ferber (tb), Mark Ferber (d), Ike Sturm (b), and special guest George Garzone (ts). Sound samples coming soon to the albums page. Listen to sound samples and buy it now at CD Baby or check it out on iTunes!